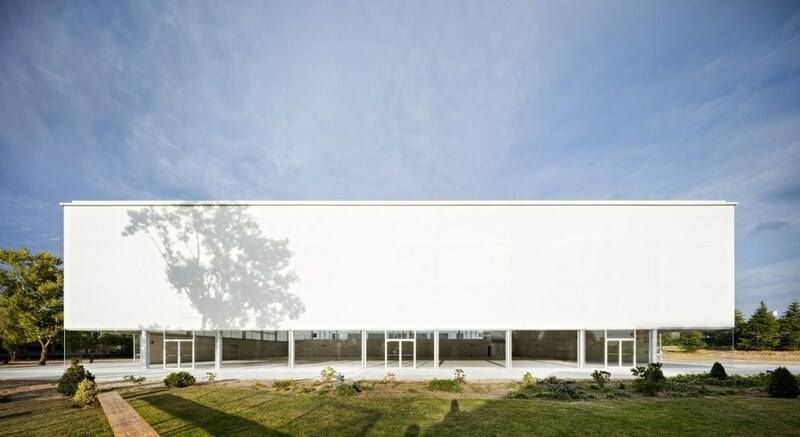 With great sobriety and formal restraint the white building designed by Alberto Campo Baeza in Pozuelo de Alarcón houses a sports center and a classroom complex. 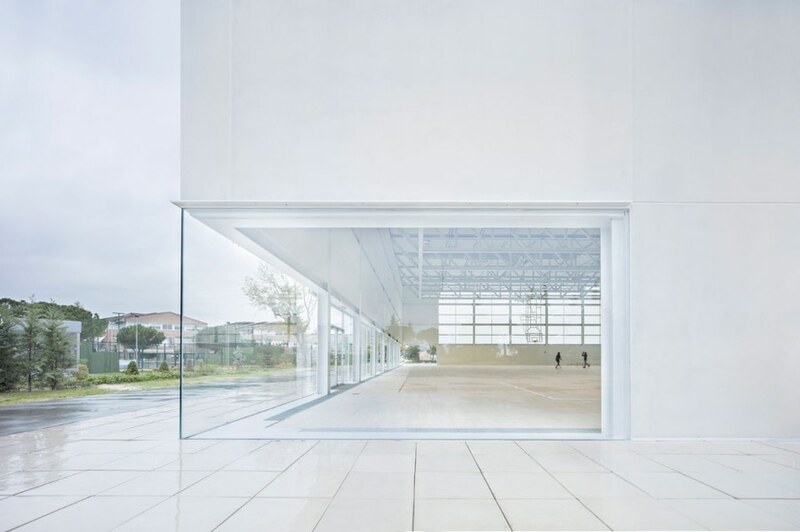 Designed by Alberto Campo Baeza for the campus of the Francisco de Vitoria University in Pozuelo (Madrid), the building houses a sports center and classroom complex. It includes the use of sports halls, multi-purpose rooms, a gymnasium, swimming pool, physiotherapy, etc. The sports complex can also be used as a large multi-purpose area and meeting hall, facilitating a range of university activities. The design of the building is restrained and volumetrically adapted to the general layout of the campus in terms of maximum height and alignment. 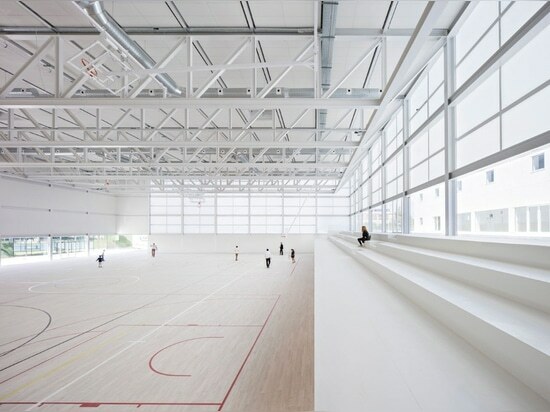 And it is intended to clearly differentiate the sports and teaching areas in terms of volume and façade material. 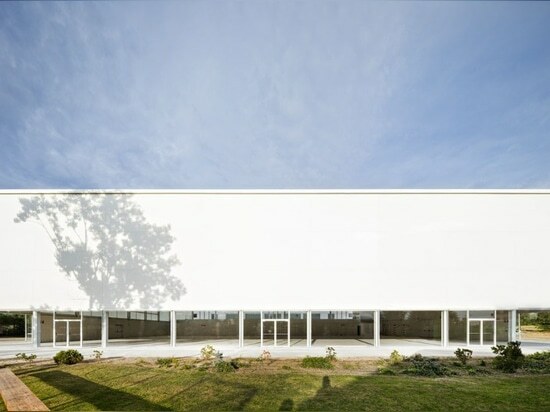 The fundamental element of the project is a large translucent box of light, 60x50x12m, filtered and controlled, entering into a spatial relationship with the main square of the campus. Two clean, well-defined boxes are joined together by a low-rise building whose roof becomes an inter-connecting patio. 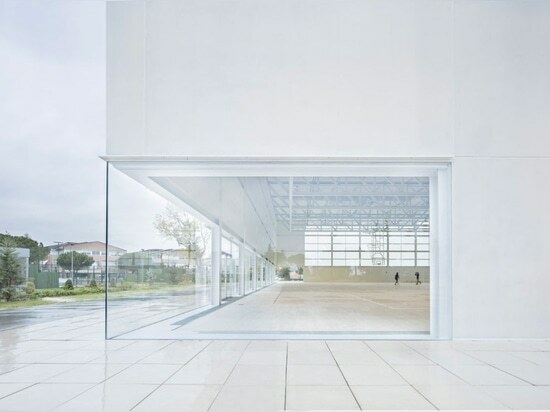 The sports pavilion is designed with lightness in mind, in GRC glass fiber reinforced concrete, unlike the more closed classroom complex and low interconnecting building. In the volume of the sports complex the orientation of the various sides are valued differently. Thus a visual relationship is created between the square and the sports complex, while the southwestern façade of the classroom complex becomes a backdrop to the complex as a whole. The structure of the pavilion is in steel: a grid of pillars and beams on the facades and trusses to resolve the great roof span. All painted in white. The remainder of the structure is in reinforced concrete, with the unique feature of wide angled beams over the basement swimming-pool area. The result is a building of great sobriety and formal restraint.